Ten table units and seven prototypes/structures to be arranged by the user in any permutation. All elements should be displayed together. Literally Based on H.Z. 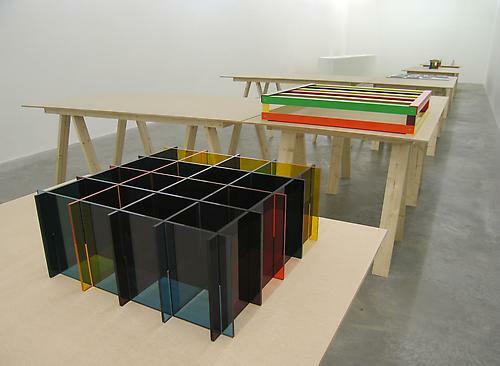 is an exhibition of new structures by Gillick designed specifically for Kerlin gallery. The title alludes to the parallel investigation of formal structure in the work of Austrian artist Heimo Zobernig. For this exhibition Zobernig has been consulted on the design of the supports for the objects presented. A series of trestle tables have subsequently been produced that carry objects that are therefore at two removes from their potential use and context. Firstly the works are defined and literally based upon the suggestion of another artist. Secondly the collection of objects should be seen as varying in scale, significance and potential, while some may be viewed as prototypes or models, others function as material tests or potential signage. Much of the work for this project is based on academic research produced in South America concerning revised, progressive industrial working practices in Scandinavia in the 1970's. The work for this exhibition has been produced alongside writing about the notion of continued production in a post-industrial landscape, where the former workers return to their now abandoned experimental factory to revisit the progressive models of production that led to their subsequent redundancy. Since 1995 Liam Gillick has published a number of books that function in parallel to his artwork including Literally No Place (Book Works, London, 2002); Five or Six (Lukas & Sternberg, New York, 1999); Discussion Island/Big Conference Centre (Kunstverein Ludwigsburg, Ludwigsburg, and Orchard Gallery, Derry, 1997) and Erasmus is Late (Book Works, London, 1995).